At Fenway Park today, during a minor league game between the Red Sox AA Lowell Spinners and the Tampa Bay AA Hudson Valley Renegades, an alligator chased this little girl around the base paths. 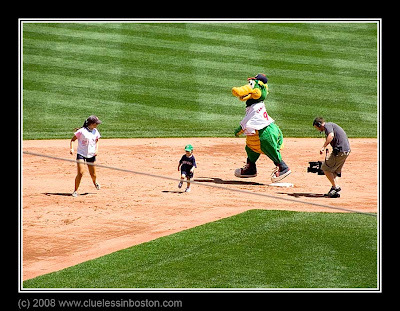 The little girl won the race and reached home before the 'gator. For the record, the Spinners won it in the 12th inning. That looks like great fun for the fans! Nice image! !